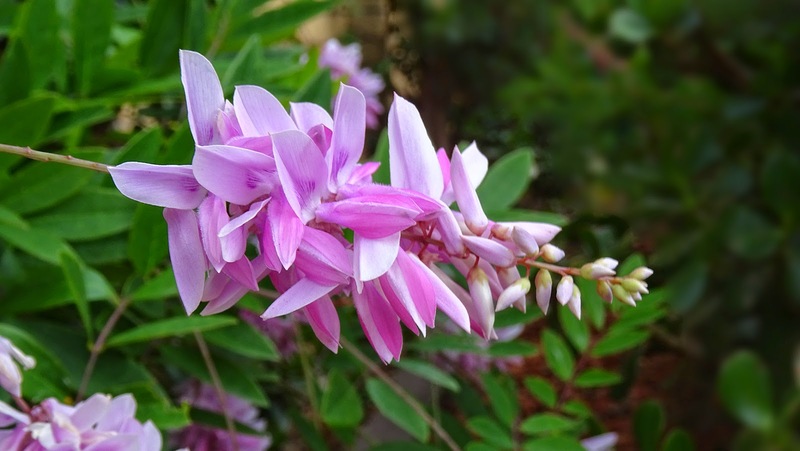 Indigofera is a large genus of over 750 species of flowering plants belonging to the family Fabaceae. They are widely distributed throughout the tropical and subtropical regions of the world. Species of Indigofera are mostly shrubs, though some are small trees or annual or perennial herbs. Most have pinnate leaves. Racemes of flowers grow in the leaf axils. Most species have flowers in shades of red, but there are a few white- and yellow-flowered species. The fruit is a legume pod of varying size and shape. Shown here is Indigofera kirilowii (Chinese Indigo), with gracefully arching racemes of pink pea-shaped flowers that make a showy display in the middle of summer; ferny foliage adds fine texture to the landscape. This is a relatively low maintenance shrub, and is best pruned in late winter once the threat of extreme cold has passed. It is a good choice for attracting bees and butterflies to your garden. It has no significant negative characteristics. Chinese Indigo will grow to be about 1.5 m tall at maturity. It tends to be a little leggy, with a typical clearance of 30 cm from the ground. It grows at a medium rate, and under ideal conditions can be expected to live for 40 years or more. This shrub should only be grown in full sunlight. It does best in average to evenly moist conditions, but will not tolerate standing water. It is not particular as to soil type or pH. It is quite intolerant of urban pollution, therefore inner city or urban streetside plantings are best avoided. Nice to see such a beautiful flower! Thank you for hosting! Very pretty! I wish everyone a wonderful weekend! Nick, I so enjoy these weekly forrays into glorious plantlife. And so many of them are totally new and exotic. So beautiful -it reminds me of an orchid:) Have a great weekend! For me an exotic flower not known, very elegant! what wonderful blossom, the colors and details are beautiful! the color is so pretty and the panicle so delicate, I love it. Ohhh, what a beautiful and exotic flower! Happy Holidays, Nick. I do love these tropical flowers, but for the Seattle area can have them only as houseplants. What a looker that one is!